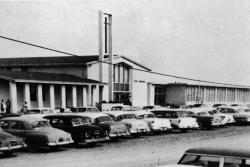 Saint Andrew Catholic School opened Monday morning, September 13, 1954, with 270 students, first through eighth grades. The school was staffed by the Sisters of Saint Mary of Namur, from Our Lady of Victory Provincial House a few miles away, along with a few lay teachers. The first principal was Sr. Marie Magdalene Barrios. By 1963, the school began to be served by the Sisters of the Holy Family of Nazareth, with more lay faculty added each year. This change has been reflected over the past years: while the first 9 principals were all Sisters, the last 7 have been lay people, beginning in 1979. In 1984, the Franciscan Friars of the Sacred Heart of Jesus Province of the Third Order Regular were entrusted with leadership of the Parish and School. At around 700 students, Saint Andrew Catholic School has grown to be one of the largest Catholic elementary schools in Texas, with 3 classes of each grade, including 3 year-old and 4 year-old preschool classes. It is housed in five buildings built around a beautiful courtyard, and also is fortunate enough to have a gymnasium and large athletic fields. Saint Andrew Catholic School is now stronger than ever with innovative programs, a deeply valued social ministry outreach, continuous progress leveling in reading and math, and a flexible upper grade program of electives. Our students consistently have won recognition from the Duke University Academic Talent Search, have been state finalists in the National Geography Bee, and have won appointments to summer academic talent camps. Saint Andrew was the first school in Tarrant County, public or private, to have every classroom and office fully connected to the internet and to each other. Our students, upon graduation from high school, have then gone on to most of the universities in Texas, to Yale, Harvard, Notre Dame, Stanford, and many others. Above all, Saint Andrew Catholic School continues to fulfill its mission to educate children to develop their God given talents, and to adopt a world view proper to those who know that they are children of God, brothers and sisters of each other, and citizens of two worlds.